Kinnerasani River is an important tributary of the river Godavari. The scenic beauty created by the landscape along the Kinnerasani River is a panoramic one abutted by lush green landscape. The Kinnerasani project or the Dam is a storage reservoir constructed on the Kinnerasani River in the Godavari Basin at Yanamboil village of Palvoncha mandal. It was completed at a cost of Rs. 558.00 lakhs in 1966 and was inaugurated by the then Prime Minister Indira Gandhi. It provides irrigation facilities to the farmers and water to KTPS at Palvoncha for thermal power generation. The dam has a storage capacity of 233 Cu.M at the full reservoir level of 407 feet. It is located in Khammam District of Telangana marked by dense forests and is surrounded by magnificent hills. The river flows its course through the Dandakaranya forest and the reservoir forms a 635 Sq. Kms. area teeming with wild life, also called Kinnerasani Wildlife Sanctuary. The dam is located at a distance of 24 kms from Kothagudem and 12 Kms from Palvancha, the site of Kothagudem Thermal Power Station. The forest department developed a deer park enroute the dam. The Kinnerasani sanctuary is a haven of exotic wildlife and tourists enjoy their visit here by spotting several animals in their natural habitat. The river dissects the Kinnerasani sanctuary and finally joins river Godavari. The sanctuary is a home for Cheetal, Chinkara, Wild Boars, Chousinghas, Sambar, Gaurs, Hyena, Jackals, Sloth Bear, Tigers Panthers, and Black Bucks. Peafowl, Quails, Partridges, Teals, Nuktas, Spoonbills Jungle Fowl, and Doves are the common birds spotted in this sanctuary created by the dam. Crocodiles also breed in the reservoir and the Kinnerasani Island. The Singareni Collieries management has constructed a Glass Rest House here that can be booked by tourists. 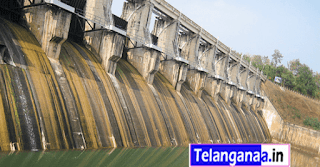 Tourists can reach the dam by road from Hyderabad (288 km), Khammam (95 kms) and Vijyawada (165 kms). Kothagudem is the nearest railway station. The dam is located at a distance of 24 kms from Kothagudem and 12 Kms from Palvancha town and is accessible by road. There are good restaurants available at both Kothagudem and Palvancha towns. Haritha Hotel Bhadrachalam, located 40 km away and operated by Telangana Tourism is an ideal accommodation option for travellers looking for a comfortable resort.